This New York walking tour of High Line Park will inform and excite you as you take in the rich history of the neighborhood, which dates back to 1847. You will learn about New York's urban cowboys and High Line Park's history, walk through the historic Meatpacking District and Chelsea Market, and even see where the Oreo Cookie was invented. This walking tour of New York City is truly a unique and educational addition to your itinerary. High Line Park was once the High Line, an elevated freight railroad track that connected trains directly to factories and warehouses. In 1847 street-level railroads allowed freight trains to utilize Manhattan's West Side as their main thoroughfare. New York's "West Side Cowboys" assisted in managing the traffic, however because so many accidents occurred, the city and state of New York and the New York Central Railroad constructed the High Line as part of the Manhattan West Side Improvement Project. After the High Line was no longer used, it was commissioned into High Line Park. This two-hour walking tour of High Line Park takes you through the trendy Meatpacking District and into the Collier Publishing building, then along the 1.45 mile (2.33-kilometer) length of the park, which was once this elevated rail track. 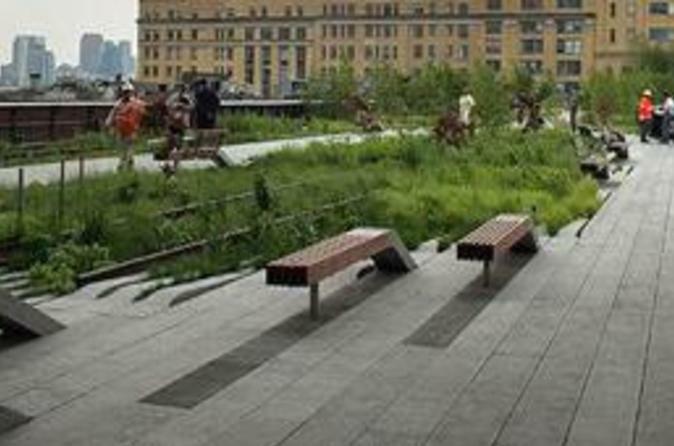 Your professional, knowledgeable guide will take you from the beginning of the Manhattan's West Side history through to the inception of the High Line, while identifying the unique plant life now inhabiting the former railroad tracks. This region has been developed with public art, and the native greenery has been incorporated with the long forgotten tracks to create a spectacular, dynamic park. You will see magnificent views of the New York City skyline as well as the Hudson River. You will also have the opportunity to visit the White Star Pier, where the survivors of Titanic disembarked, as well as the old Nabisco factory, where the Oreo Cookie was invented.